Munich - FC Bayern München were happy their persistence paid off against a deep-lying Hertha Berlin side after eventually securing a 1-0 win, while the visitors lamented missing their one golden chance during the game. 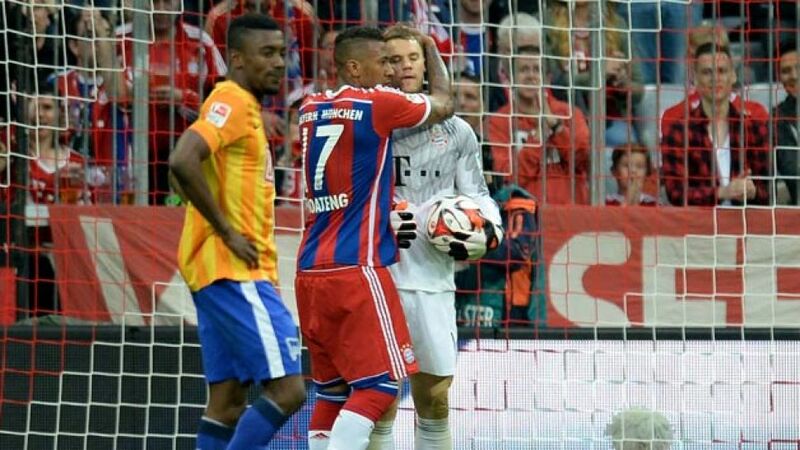 Manuel Neuer: "We needed a while to get into the game today which is why we were a bit sluggish in the first half. Mitchell [Weiser] did very well to get through three or four players on the right and he played a great pull-back [to set up Bastian Schweinsteiger for his goal] - I’d like to be on the end of a ball like that! Hertha sat very deep today and defended their penalty area well, which is why we needed a stroke of genius like the one Mitch produced today. [On Nico Schulz's chance] When a player is coming at you one-on-one you don't really think about it much - maybe you just consider which is his strongest foot. Luckily I came out on top in that situation." Mitchell Weiser: "I controlled a loose ball and then I managed to dribble my way past three players to the by-line, before pulling it back for Basti [Schweinsteiger], who finished it really well. Hertha sat back a lot and made life difficult for us. We had to be patient - we didn't score until the 80th minute. Thankfully we were able to reward ourselves for the effort we put in." Thomas Müller: "The game panned out the way we expected it would - we knew it’d be tough. They defended very deep and very well. It’s not easy to play against sides who are so well organised. We scored after a great run from Mitch and Basti finished it off clinically. We’re not celebrating winning the title just yet as mathematically it’s not yet certain." Philipp Lahm: "Hertha defended in numbers and did very well. We wanted to do more than we actually did today but it was important that we won at the end. We definitely need to improve for Tuesday's game [against Dortmund in the DFB Cup]. You aways want to play well but it's not always easy to do so." Robert Lewandowski: "It wasn’t a great game today but we’re happy we won and it was another step towards the title. We always give 100 per cent but it’s difficult to play attractive football when the opposition defend so deep. If we’re not confirmed as champions then there’s always next week!" Nico Schulz: "[On his one-on-one chance with Neuer] I should’ve put the ball through his legs as he had them wide open and stayed on his feet for a long time. I should’ve buried it. It was fun to play in a stadium like this against the best team in the world though." Sascha Burchert: "When Thomas Kraft wasn't able to train on Friday I pretty much knew I'd be in goal here. It was good to be able to prepare for the game - which is easier than coming on as a substitute. I was only able to play so well today because we defended so well as a team. Thank you to my team-mates." Sebastian Langkamp: "We managed to keep Bayern at arm's length today, they only had one or two opportunities. If we'd scored our clear-cut chance then we'd definitely have gone home with a point. I was delighted for Sascha Burchert that he had a chance to play today. He was great in goal and made some good saves. He was a very calm presence and that's what you want as a defender."